With Sarasota’s unusually wet summer, ArtisTree’s crews have seen new cases of boron deficiency in areca palms. Boron can leach through the soil after one heavy rain, and the results aren’t pretty. According to the University of Florida’s IFAS Extension Service, one of the earliest symptoms is transverse translucent streaking on the leaflets (see photo). Even a temporary boron shortage can result in a wide array of symptoms on newly emerging leaves—including tissue death, failure of new leaves to open and the tendency for the entire crown to bend in one direction. Because the difference between boron deficiency and toxicity within plants is rather small, extreme caution should be exercised when applying any type of boron fertilizers. Current recommendations for correcting boron deficiencies in palms are intentionally conservative because of the potential to reach toxic levels quickly. Attempting to apply boron fertilizer yourself could result in killing your turf grass or groundcover. 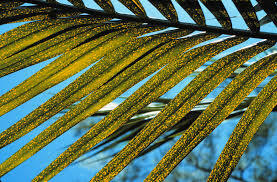 It’s best to contact a certified fertilization expert to treat any palms that appear to have a boron shortage. Then be patient. It will take at least five months for the results of a boron fertilizer application to show results — and for you to enjoy your beautiful areca once again.